Happy Monday!! The world of fashion is often baffling to ordinary women. And every so often a trend comes along which seems utterly ridiculous, yet catches on. Take the current obsession with ripped jeans. You can barely walk down any High Street without being assailed by bare knees, calves and thighs — all protruding through swatches of tattered denim. I’m a huge fan of denim, I’m always looking out for innovative and better ways to get jeans on the market. Of all the crazy things that girls do in the name of fashion, distressing jeans might top the list. Ripped jeans are back in fashion in a very quiet way, subtle if you will. Maybe they were never really gone. Anyway… they’re present in #OOTDs, in weekend getaways, in casual looks. Their in-your-face-initial trait is gone (thank God!) and what we’re left with is a very polite ripped jeans situation. If you feel you look too trendy and blogger-ish, drop the whole ripped jeans style, or just simplify it. There’s only one thing worse than looking like a Fashion Desperado, and that’s a Fashion Desperado in ripped jeans. Size and design wise they look better when slightly bigger – think boyfriend styles. Have fun with their cuts and designs and go anywhere from super low waist to very high.If you choose to wear heels go more for that sophisticated style a la Rihanna or very minimal fashion week street style. Always looking so stylish dear Len. Thank you for the styling tips. Have a blessed week. Much love! 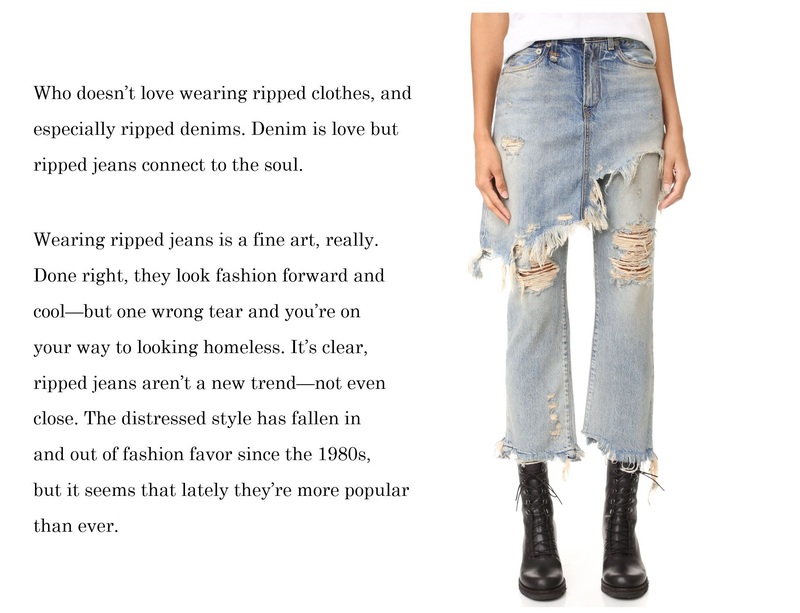 Len, you look gorgeous as always in this ripped jean look! I love how you styled it with a chunky sweater and jacket! So chic! Have a great week! You look gorgeous as always babe! Have a nice day my dear. I also love denim, especially ripped jeans! Can´t imagine my life without them – love your look and selection! Love your outfits babe. The distressed denim you’re wearing in all the shots are fab. You look gorgeous Len! Blue really looks fab on you dear. You rock blue outfits effortlessly. Love the heels too, such a chic contrast for the top.